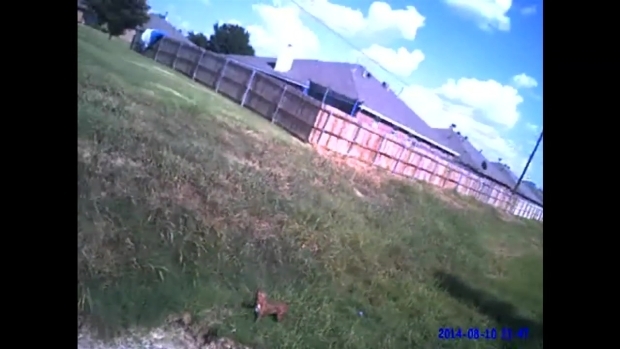 Owner of Dog Cleburne Police Officer Shot in Video: "I Couldn't Believe It"
Earlier Tuesday, the city said it was expanding its review of the August 10 shooting, which came to light after Maximus' owners filed an open records request for the police report and video. The city has asked the Texas Rangers and another agency to conduct their own independent investigation. GRAPHIC WARNING: A Cleburne police officer's lapel camera shows the officer shooting a dog he claimed acted aggressively Oct. 17. Amanda and her husband Quinton say all their dogs are loving and friendly. But they managed to escape from their fenced backyard that day, and a neighbor called 911 to report that pit bulls were loose. The police officer said in his report that when he arrived near Lindsey Lane, he eventually found the loose dogs roaming. "As soon as I lifted my pistol, the dog began coming up the hill, continuing to growl and showing his teeth," the officer said in the report. The officer involved in the shooting was placed on administrative leave Friday and is currently living with family out of state, because he has received death threats via social media. "The city is obviously concerned about the video showing an officer shooting a dog," Cleburne police spokeswoman Kelly Summey said. "As is often the case, the short video does not tell the whole story." Police said the officer was responding to a 911 call when he found people pinned in a vehicle by three dogs. The officer was trying to secure the dogs until animal control arrived when, according to police, one dog became aggressive. Mayor Cain said he was confident that following the reviews, the shooting would be handled swiftly and decisively, and added that he was concerned about the death threats against the officer. "Level heads must prevail," he said. "Threatening our officer is not only counter-productive, it is a crime. Should these threats continue, we will turn them over to the appropriate authorities for prosecution." The Cleburne Police Department asked that anyone who saw the shooting contact the Professional Standards Unit at 817-556-8894. NBC 5's Todd L. Davis contributed to this report.